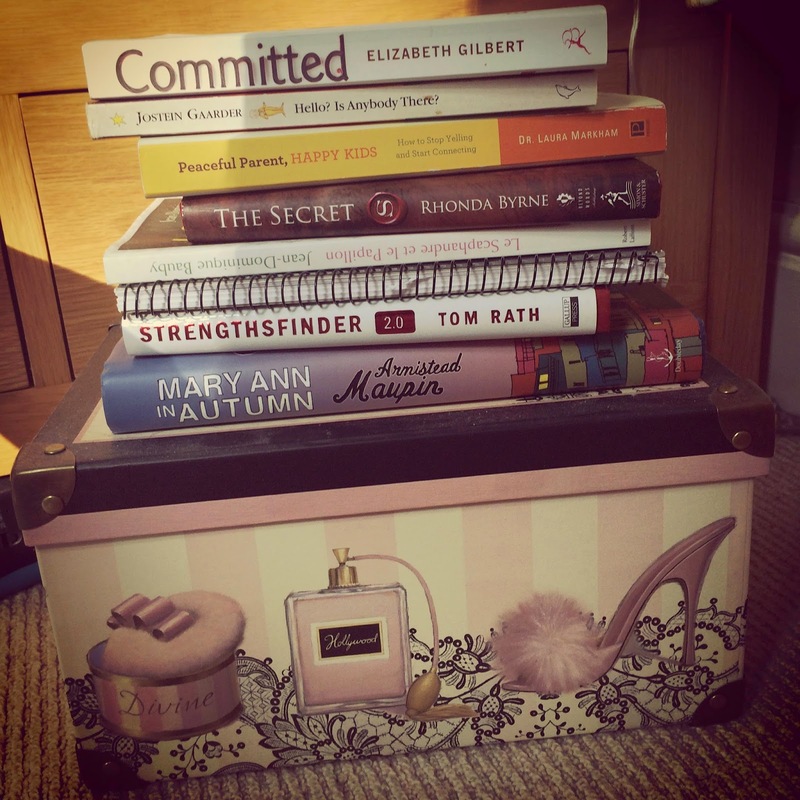 such lovely things: Where would my life be without books?? I confess, I'm a book-lover! My house is definitely testimony to that - bookshelves in every room (except the toilet these days since it's now a wet room!!) and a not so small pile beside my bed of those books I'm either reading or would like to read. The books beside my bed. The box is full of books too! But it goes beyond the physical book in my hand. When I was a child my dad worked at a printer's - the then famous Purnell's - and would often bring home books for us. I didn't realise until much later the reason they all had little squares cut out of the title page (to establish the exact paper weight when estimating costs), I just thought some books had this! 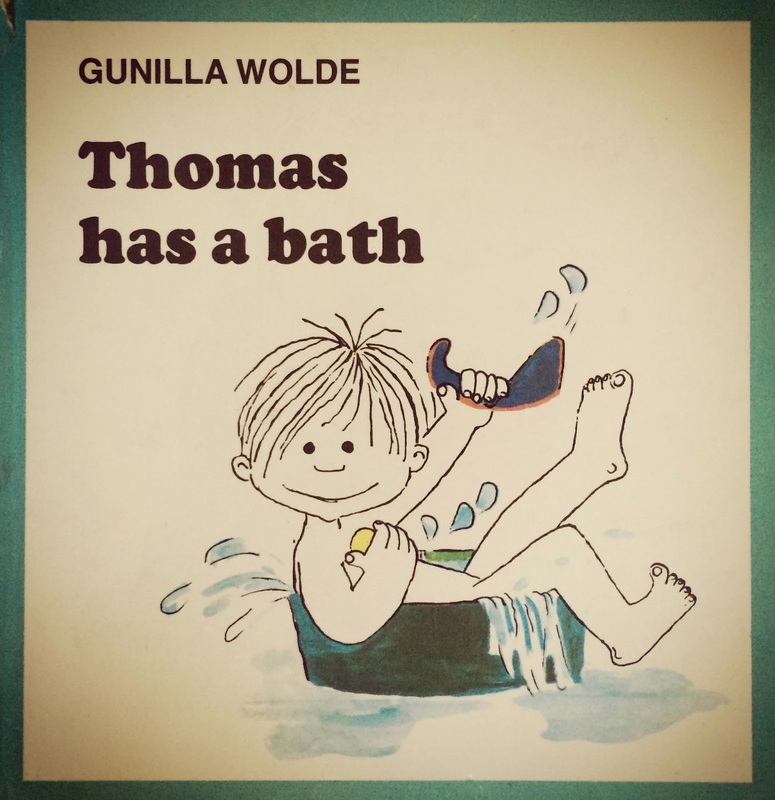 One of the series I remember most were 'Thomas' books. No, not the Tank Engine, but a little line drawn boy, Swedish, I think. There were several books & even then I appreciated the simplicity of the design, the mix of colour & black & white. It makes me feel warm inside just thinking about these books. I still have a couple & read them with my children. 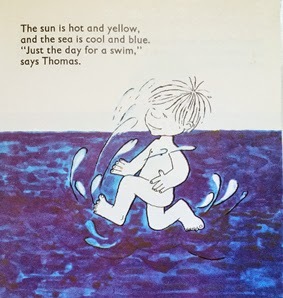 Both are the source of discussion for different reasons, but it's the same discussion EVERY time....one has been scribbled in (not by me I must add) and the other shows Thomas' boy bits when he jumps in the bath! Both are of concern & hilarity!! School of course brought many a book, but the one that stands out is 'To Kill a Mockingbird' by Harper Lee. I think I first read it when I was 14 or 15, then again when I was 18. I hadn't realised until I read it again in my mid-thirties, quite how much this book had influenced my sense of social responsibility. It is definitely one of my 'go-to' books when I need a good read. After finishing my degree & travelling the world for almost a year, I decided to do a Printing & Publishing course at the London College of Printing. And so began my own career in books. I ended up specialising in Children's Books & worked in that industry for almost 20 years before stepping out to be at home with my children. I have heard said many a time that everyone has a book in them. I've always doubted that since I've always thought of that book as a novel and, whilst I can sort-of write, I get so carried away I think the readers would lose the plot completely! But, d'you know, I think 'they' might be right!! Mine is definitely not a novel but a craft book for little kids. It's what I do every week at Little Me (a toddler group for 0-5's) but in book form. Fingers crossed something might happen with that. But, the most important thing to come out of my love of books is the Book Club I'm in. We meet once a month in one of our houses and share an evening of discussion & laughter - sometimes about the book we've read, sometimes not. These women are phenomenal and beautiful and I don't know where I'd be without them. It's like a therapy session with nibbles, wine and a book! What more could you ask for? We began some ten years ago & were all dubiously linked through the book trade - writers, illustrators, designers, creators. We used to meet at the pub or at parties but with the introduction of children in our lives, we didn't seem to get together quite so regularly. But books and a Book Club we could justify! And so began one of the greatest things in my life. Some have come & gone but still Book Club remains an important and integral part of my life. The third Thursday of the month is sacred and I will rearrange anything and everything not to miss it! 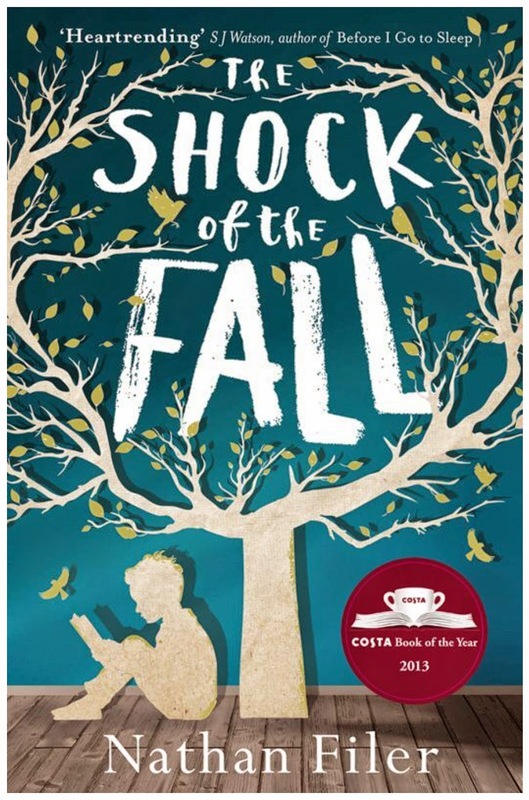 This month we'll be reading 'The Shock of the Fall' by Nathan Filer. Anyone read it yet? I will put to kill a mockingbird on my reading list alongside The shock of the fall.